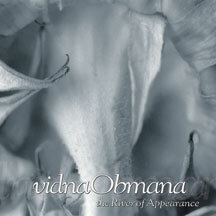 (10th Anniversary 2-CD edition) | Projekt re-releases vidnaObmana’s classic the River of Appearance with a bonus disc, the entire album performed by Oregon’s Dreams in Exile. River was a high point of Obmana’s early compositional style, presenting a minimal and serene flow utilizing sparse piano lines which intermingle with drifting keyboard loops and organic rainstick sounds. There is an overall harmonic unity on these 8 pieces, stripping dense walls back to reveal a slowly changing sound configuration. The 2nd disc is not merely bonus tracks, but a complete re-creation of the original on traditional instruments. >Re-experience the everlasting melancholy of the River of Appearance on this exceptional 10th anniversary 2-cd release. Nach der The Origin Reversal bin ich erstmal ganz vorsichtig an weitere Musik von Dirk Serris, bzw. Vidna Obmana herangetreten. Nachdem ich aber Ausschnitte der The River Of Appearance gehört hatte, schöpfte ich neuen Mut und bestellte sie mir. Mein Mut wurde belohnt und ich bin froh, dass ich an Dirk´s Musik drangeblieben bin. Das Original brachte Dirk Serries unter seinem Pseudonym Vidna Obmana bereits 1996 heraus, 5 Jahre später erschien die Musik im neuen Gewand: mit Gastmusikern, akustischen, traditionellen Instrumenten und Vocalisten ….. ich war wirklich erleichtert, dass es auch “leichte” Musik von Dirk Serries gibt!! Athmosphärische, ruhige und harmonische Stücke im Ambientstil, die durchaus meditativen Charakter hat. Obwohl die beiden CDs die gleiche Tracklist aufweisen, wirken sie sehr unterschiedlich. Die erste CD ist elektronisch und minimalistisch ausgelegt. Ideal zur Entspannung und Meditation.